Thanks for your kind well wishes. You're all so lovely to spare a moment for me! The cold symptoms are pretty much gone, the bed rest is and has been more about, well, resting. I was very lightheaded and nauseous on Monday which got me the extra round of downtime. I've been getting better since with all that sleep and no nothing but today I got half an hour in the park with my nephew and sister to get my blood pressure going a little. (He's still cute as a button!) Afterwards I was knackered and had a proper midday snooze but it was a very welcome change and more importantly needed. Can't risk a cold start on Monday but need to ease into being up full time again. Well, enough with the whine and onto the interesting bit. Tada! 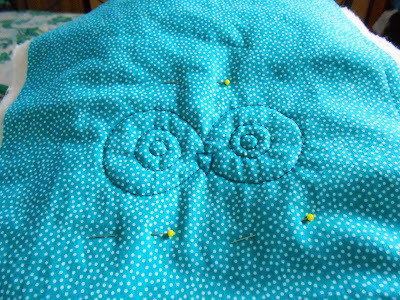 I've taken up working on the Red Riding cushion cover again. Can't believe how long I've been stalling this but somewhere along making plans for the hand quilting and deciding on an owl I'd hit a creative wall that I tore down yesterday. I'm using this as a guide. Whoop, getting all excited about this project again. How cute is this little owl!